This decanter is the 400th Anniversary of The Dutch East India Company (or in Dutch: Vereenigde Oostindische Compagnie, or VOC "United East India Company". The Dutch East India Company was established in 1602, when the Dutch States General granted it a 21-year monopoly to carry out trade activities in Asia. The VOC is often considered to have been the first multinational corporation in the world and it was the first company to issue stocks. The Dutch East India Company was a powerful company, possessing quasi-governmental powers, including the ability to wage war, imprison and execute convicts, negotiate treaties, strike its own coins, and establish colonies. Naturally smuggling and racketeering was a major concern for the company as it was for many others. The Dutch East India Company eclipsed all of its rivals in the Asia trade. Between 1602 and 1796 the VOC sent almost a million Europeans to work in the Asia trade on 4,785 ships, and netted for their efforts more than 2.5 million tons of Asian trade goods. By contrast, the rest of Europe combined sent only 882,412 people from 1500 to 1795, and the fleet of the English (later British) East India Company, the VOC's nearest competitor, was a distant second to its total traffic with 2,690 ships and a mere one-fifth the tonnage of goods carried by the VOC. The VOC enjoyed huge profits from its spice monopoly through most of the 17th century. 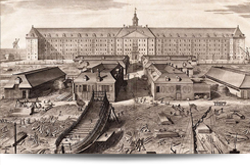 The Dutch East India Company eventually became weighed down by corruption in the late 18th century, the Company went bankrupt and was formally dissolved in 1800. The possessions and the debt of the company was taken over by the government of the Dutch Batavian Republic. The VOC's territories became the Dutch East Indies and were expanded over the course of the 19th century to include the whole of the Indonesian archipelago, and in the 20th century would form the Republic of Indonesia. The whisky that would have been drunk then is no different than the Smugglers Gold that can be enjoyed today, however we at Gaelic Pure Scotch Whisky guarantee the age of our Pure Scotch Whisky.